This trip is designed for you, someone who has a passion for medicine, who wants to help people both physically and spiritually. As a member of this team, you’ll be led by missionaries Dr. Pete and Angela Olsen who have a heart for seeing lives transformed through medicine and a relationship with Christ. On this team, you’ll see how Chogoria Hospital, a mission hospital in rural Kenya, is instrumental in transforming lives. 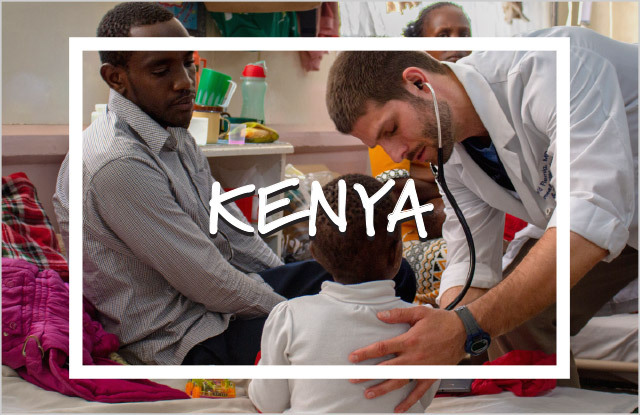 You’ll be able to shadow physicians, pray with patients, and do visits in the community. This trip is designed to open your eyes to cross-cultural medical ministry and help you see how you can be a part of what God is doing through medical missions. Day 2: Arrive in Nairobi on Saturday night. Day 3: Spend the day in Nairobi (adjust to time change, orientation, visit Nairobi ministry, etc.). Day 4: Head to Chogoria: 3.5-4 hour drive. Day 11: Leave for game park in the morning, do afternoon/evening game drive, followed by a team debrief. Day 12: Morning game drive, travel back to Nairobi, fly home that evening. *This schedule is tentative and could possibly change. The cost is $1,400 plus airfare. The final total varies, depending on team size and flight costs which vary depending on your departing airport location. Your final trip cost will be given to you after flights are booked. Flights are expected to be around $1,500. All funds will be raised through an individual account you will receive with WGM. WGM has its own “Go Fund Me” platform for you to raise money with no fee. You will be provided with a detailed list of those who give to your trip. Costs not included in the trip price are: meals while in airports during travel days when traveling to and from the U.S., any fees associated with baggage or immunizations, passport, personal shopping money and incidentals such as snacks, additional beverages, phone calls, and other personal items. A visa is required for travel to Kenya. Your team leader will assist you in applying for this prior to your trip. I understand that this mission trip starts the day that I apply. As part of a WGM team, I commit to reading all material and emails pertaining to the trip. I also commit to attending virtual meetings with my team leader and fellow team leaders, recognizing that these are vital to maximizing the effectiveness of the team. For this team, these virtual meetings will start at least five months prior to the trip and will happen five—eight times. These virtual meetings will focus on spiritual preparation, developing team unity, and preparing for the trip. I also understand that I will need to provide the funds for the trip, either through fundraising or personal contributions. Pete: I first felt called to the mission field as a pastor, but as it turns out, God filled me with a love of the way He created the human body and allows us to interact with it. As I continue to follow the Great Physician throughout my career, He’s led me to many hospitals—big and small, inside the U.S. and abroad—all with the goal of glorifying Him by bringing His healing to people who are sick and in need of the love of Jesus Christ. I received my MD through the University of Minnesota in 2010 and completed Family Med residency in Duluth, Minnesota in 2013. I focused intentionally on rural family medicine to build the broad skill set that allows me to serve well in many different circumstances. I’ve always been passionate about teaching and discipling inside and outside the medical field; mission mobilization feels like a very natural part of my call. I’m thankful for the opportunity to lead this trip with my wife. Angela: I love to travel. I always thought I wouldn’t travel as much after having kids, but that hasn’t been the case at all, especially after becoming missionaries! We took our first, two-month trip as a family to Kenya in 2013 when our kids were three years-old and seven months. We eventually moved there in June 2017 as long-term missionaries with WGM and stayed for 13 months. We hope to move back to Kenya before long. I have a degree to teach middle and high school English and a Master of Education, so I thoroughly enjoy teaching in any capacity whenever possible. Our home is in Duluth, Minnesota, and I currently work with WGM as a writer, editor, and social media coordinator while Pete and I work toward a masters degree in biblical and theological studies with Dallas Theological Seminary. In my free time, I like to write, read, bake, drink good coffee, and go camping. I’m so looking forward to co-leading this trip to Kenya!